shirls gardenwatch: It was a Tawny! I’d like to thank everyone from the comments on my posting, the replies on my Birdforum thread and all the emails I received especially from people new to my blog. It gave quite a buzz here as they all came in and when the BBC Autumnwatch programme last night also featured the Tawny Owl (with one in the studio too) I couldn’t believe the coincidence! More emails followed asking if I had seen the programme… how brilliant that was too! The call I heard from my garden was from a female Tawny Owl. This morning I began looking for info on the Tawny and found some very interesting stories so I’ll come back to it in a fuller profile posting of this bird. What I will add briefly here is that the BTO want to hear of any Tawny Owl sightings (listenings more likely) for their Tawny Owls - Autumn Survey 2009 and they have a page with links to Tawny Owl calls you might hear in your garden, parks, woodlands or walks which will help you. It is great fun watching the comings and goings of birds to our gardens when we are able to do it. My garden has been pretty static over the summer with fewer sightings of birds feeding from the ground and food being wasted there. Now it’s into gear again and everything is getting interesting again! Yesterday, as I was writing my posting, a familiar flight pattern that I haven’t seen for a while caught my eye out the window… the bumble bee and bobbing characteristics of the tiny Wren. Normally the Wren is more secretive hiding in the undergrowth but here it was exploring the feeders in a rain shower! I had to be quick with my camera and my pics are not the best as I didn’t change the previous setting for very dark conditions but I still wanted to share them. Would you believe it… today I spotted another bird that caught my eye as I was looking for info on the Tawny Owl! Would you also believe it that I never learned my lesson from yesterday and hadn’t changed the setting on my camera! 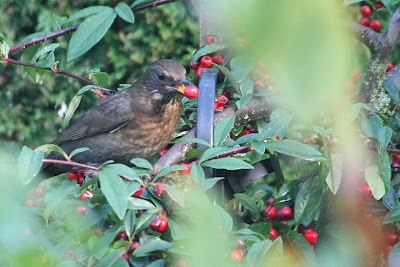 Once again though, I wanted to share the capture of a female blackbird eating the berries on my Cotoneaster tree... as she had a berry in her mouth! Yep… the garden is definitely changing at the moment and if you don’t gardenwatch already it’s a great time to start now! 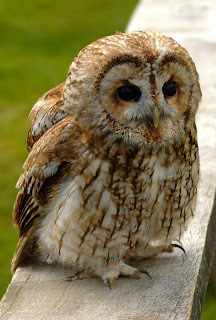 The Tawny Owl photo above was not taken by my but from Wikipedia. Details of its licence can be seen here . The other photos were taken in my garden with the wren photos taken on November 6th 2009 and the Blackbird photo taken on November 7th 2009. We have lots of woods but we seldom see and owl. That does not mean they are not there however. It is so nice to see your account. Frustratingly I couldn't listen to your sound clip yesterday (long story about uncooperative computers!) but had a sneaky feeling it would be a Tawny Owl - they make such weird noises! We hear them regularly, the female's 'teeerwit' and the male's 'toooowhoooo'. In the summer we hear strange squeaky wheezy noises and eventually realised it was the Tawny Owl youngsters who were learning to fly from tree to tree around the garden - wonderful! I'll pop over to the BTO site to fill out a sightings form. Hope you too get to hear and see your owls throughout the year. It is exciting to have any owl in your garden but a Tawny Owl is fantastic. That little wren is a cutie too. Glad we solved your mystery. Did you know that if you go out and call to your tawny it might reply to you. I had quite a conversation with one in my garden last winter, and had another fly towards me in a wood once after I called it... amazing experience (Chris Ferris in her book used to carry one around the wood at night that landed on her shoulder). Beautiful and mysterious bird. I'll be doing the survey this autumn. Hope my autumn tawny comes back this year. Great sound clip in the previous post Shirl, we have had a pair in the woods behind our house for a few years now, but never fails to get me excited when I hear them calling to each other. I have only seen them a few times with a torch, stunning birds and surprisingly loud for an hunter that is silent in flight :). Mike. Hi Shirl.....I have a tawny owl that hunts in my garden. I have glimpsed her once and she did drop a feather, which I have kept. They are so beautiful. Apparently little is known about their behaviour because they are very rarely viewed....only heard. I wish I had caught your mystery bird post earlier as I think I would have got it right, I heard two this year but when we were out and not in the garden, unfortunately. I bet you were amazed at the coincidence when they brought the Tawny on In AW Unsprung! I really loved your mouse photos and the video, it reminded me that last Winter I pushed a small mesh feeder into a woody old Clematis for small birds such as Dunnocks or Wrens and often when I went to refill it I would hear rustling, then one evening I saw a tiny mouse or vole feeding from it. It didn't seem bothered to see me and I tried to get a photo but it was just too far and dark within the Woody stems. I have never seen it again but the seed still goes! Lovely to see the Wren photos, I think they are very difficult to capture. I also loved the Blackbird pic so pretty! Thanks for the link to the BTO survey. I have added my observations / hearings to the list. The female call is still quite eerie even when you know what it is. I saw one twice earlier in the year but always too dark to photo unfortunately. mothernaturesgarden – Very true, I guess we just have to be wandering out at the right time and in the right area. They do seem to move around. I guess the territory they keep is a good size. I have been delighted to share our visit. I wonder if there is any chance at all that I’ll be able to record sightings in my garden… that would be fantastic! flora/fauna are part of it. It is a great satisfaction to watch the interaction of birds/insects in your gardens. It is something that is not kept in perspective, focus. Congratulations. Good luck in your projects. Hi. I've just discovered your blog. I used to hear Tawny Owls behind our house in Ross-shire but only ever got fleeting glimpses of them. I now live in Tasmania so I have enjoyed looking through some of your posts which bring back good memories for me. Just catching up again so I missed all the excitement with your mystery bird - how lovely for you to discover you have a tawny owl! No owls here sadly, but we often hear them when we're on holiday (as we tend to stay in cottages in rural areas) and we're always thrilled when we do. We do have wrens, but I've not seen one out in the open like yours - very bold, isn't it?! Ours are usually skulking among the climbers on the trellis. I believe they like cheese - often wonder whether they'd come out a bit more if I put some out for them, but I suspect R would object to my pinching his cheese! That Owl is sooo cute! great that you could confirm id on it! !